Recently a prominent European retail chain conducted a litmus trial with FlexfreshTM liner bags by shipping blueberries from South America to Europe. This journey usually takes more than 5 weeks by sea. "While the loose blueberries resulted in an average weight loss of 19.96%, those packed in FlexfreshTM lost a mere 0.76% weight after a period of 7 weeks, thus registering a 96% reduction in weight loss upon arrival," according to a spokesman from Uflex. FlexfreshTM works on the principle of Active Modified Atmospheric Packaging (AMAP) – a solution that Uflex has launched globally in collaboration with the Perfotec B.V of The Netherlands. FlexfreshTM is a special, patent protected, polymeric packaging film, manufactured by Uflex for packing fresh fruits, vegetables and flowers. Perfotec supplies the Fast Respiration meter for ascertaining the respiration rate of the fresh produce and the associated software for calculating the required film permeability. The Perfotec laser system subsequently uses this information to adapt the permeability of the film offered by Uflex through micro perforations. This solution maintains the ideal Oxygen and Carbon Dioxide inside the liner bags to maintain freshness and extend shelf life of the product. In the recently held trials, the objective of the retail chain was to ascertain if it was possible to ship and store the soft fruit (blueberry) for 7 weeks in a Flexfresh™ liner bag. 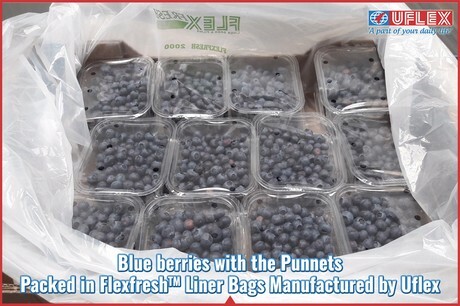 The blueberries were packed in punnets, with and without, FlexfreshTM liner bags. In a separate lot, loose blueberries were packed with and without FlexfreshTM liner bags. After 7 weeks the blueberries in the liner bags were found to be good, firm, crunchy and tasty. However those packed in a controlled ambience were mostly collapsed and mouldy. "The results also established that pre-packing itself is not enough as it can address the issue of weight loss but not quality. Punnets with and without liner bags resulted in 0.76% and 2.56% weight loss respectively. Both these figures are significantly lower than the 19.96% weight loss registered in the case of loose blueberries. The punnets that were not using liner bag still showed the same quality problems like mouldy blueberries.